Nobody wants pool season to end, but when it’s time to put away the pool floats, sunglasses, and beach towels, S&R Pools is here to make sure you have a great safety cover to keep your pool safe until next season. In fact, our safety covers can be used at any time of year. 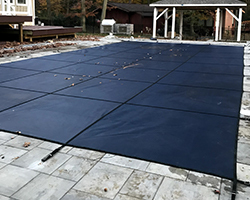 Whether there’s a storm coming in overnight and you want to keep dirt and leaves out of the pool or you need to close up the pool to prevent people from falling in during an event, you can trust our custom-fitted safety covers to get the job done. Our covers come in two forms, mesh and solid. Mesh covers allow precipitation through but catch debris, which eliminates worry about water accumulation. Solid covers prevent a majority of contaminants from entering your pool, keeping it cleaner and saving you money on chemicals. The solid covers also feature a drain to minimize rainwater accumulation. When you choose us, we custom-fit the cover to your pool, making sure you have a system that’s long-lasting and easy to use. If anyone understands pool ownership, S&R Pools does. We’ve served pool owners since 2009, providing liners and covers that make pool life easier. Your needs and budget are our first priorities, and we won’t quit until you get what you need. Learn more and get your free estimate today!